Welcome back, Ashes players! 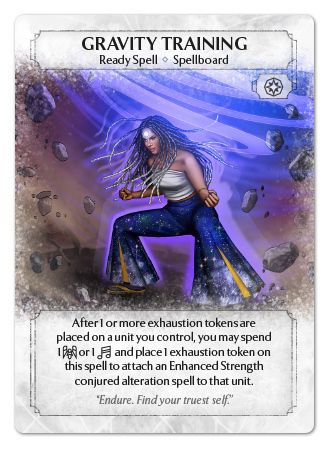 Today we return to the Masters of Gravity side of the previews to see what sort of ready spells Echo brings into the mix! 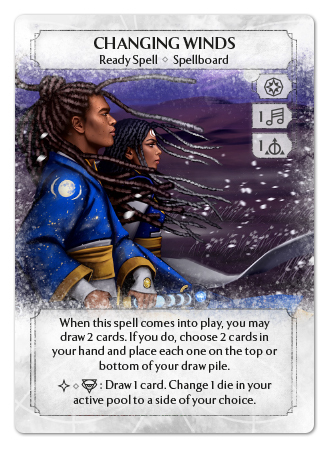 We are beginning to see that Echo’s game plan is to subtly manipulate the state of the board through exhaustion tokens and strike through with an elite team of warriors who can handle the burdens of gravity set on the battlefield. Let’s take a look at how Echo's ready spells aid in this strategy. Gravity Training will help make sure Echo’s units are prepared for the burdens of his power, all while they watch the opponent struggle under Echo's Increased Gravity ability. Gravity Training offers the user a Parallel Cost of 1 or 1 to attach a conjured alteration onto a unit they control when it becomes exhausted. This Parallel Cost should excite avid deck builders as it is an affordable and flexible cost for quite a strong effect! 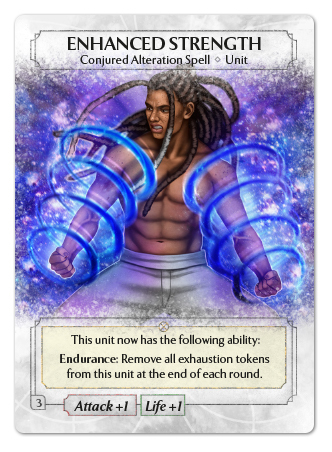 Units who gain Enhanced Strength are given the Endurance ability, which will help them fight off opposing threats of multi-exhaustion, such as Steady Gaze, Blood Chains, or a pack of Blue Jaguars! This spell also provides a +1 Life boost to help ensure our new trainee survives for the next round and hits a little bit harder with +1 Attack! Echo has more ways to capitalize on an exhausted opposing board than just locking the opponent out of options. Meet the Mirror Spirit! They may look like just cute little galaxy dogs, but under the right conditions, they can really pack a punch! 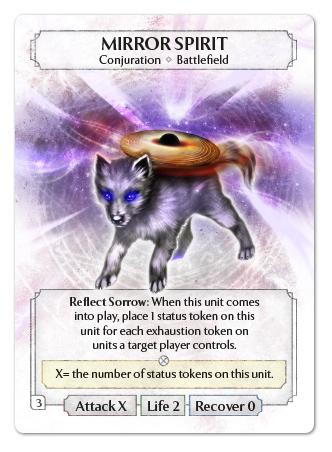 A Mirror Spirit that is summoned onto a battlefield after many units have already battled and became exhausted can gain plenty of status tokens to boost its attack and swing in past exhausted units to hit for massive damage! Mirror Spirits aren’t just a late-round offensive threat, but also a strong control option. 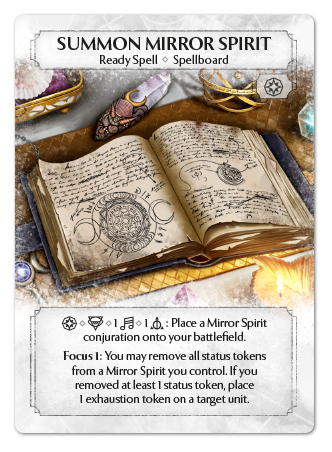 Take a look at the Focus 1 ability on Summon Mirror Spirit. Once you have used your Mirror Spirit to attack, you may consider cashing in those status tokens for some more unit exhaustion! Summoning a chain of Mirror Spirits can potentially stop an entire wave of units as they come out, one after another. You may even try using Blood Chains to sacrifice your Mirror Spirit to get even more value out of them after attacking and spending their status tokens! Between the Mirror Spirit's offensive power, exhaustion utility, and cute face, what’s not to love? So far, we have already seen a wide range of Echo's exhaustion token manipulation effects and how powerful these can be. I’d like to take a step back from those to show off a new powerful tool for the Sympathy magic toolbox; Changing Winds. Changing Winds is a card that feels like the pure essence of Sympathy magic. When it enters play, you get a supercharged Sympathy Dice Power, allowing you to manage your hand and deck to fit the current state of the game. In addition, Changing Winds provides the first repeating and free card draw in Ashes. This ability is truly a force to be reckoned with, and also helps fix your dice to get the power symbols you need, offsetting some Meditations! The impact this combination of effects can have on deck building and gameplay is immense. Changing Winds can be the card cycling and card draw needed to quickly get your Summon Butterfly Monk and Summon Shadow Spirit spells fully focused, while also providing the power dice necessary to summon them. It can also be an ‘on-demand’ activator for The River Skald’s Harsh Melody or the Squall Stallion’s Opportunist ability! The options provided by Changing Winds are only just beginning, and I hope you enjoy exploring the nuances of this powerful ready spell.